When we purchased a condo in Duluth last June one of the reasons we were interested in Duluth was the availability of outdoor activities. Outside Magazine had identified Duluth as one of the top ten outside places. Residents have access to many hiking, skiing and biking trails within the city. They also have access to various water sports. Within a couple of weeks of purchasing the condo Duluth experienced a 100 year flood with over 10 inches of rain falling within a short time. 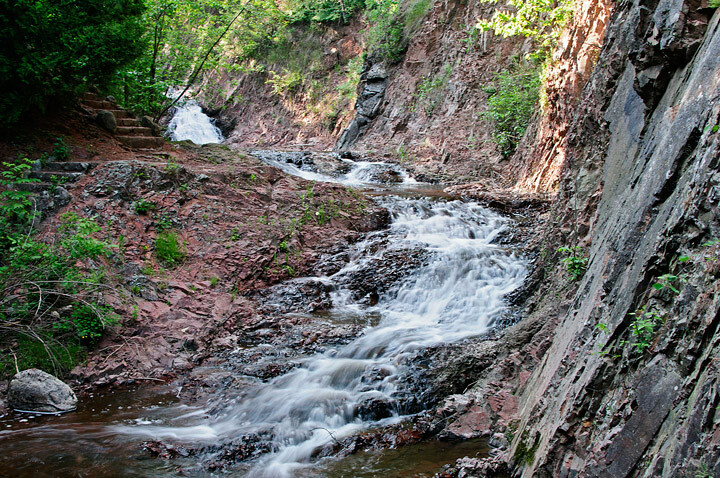 Duluth has 43 named streams flowing through the city and many unnamed streams. During normal times most of the streams meander through town with not that much water flowing in them. Because Duluth is situated on a 1500 foot escarpment any rain quickly moves from the top of the escarpment toward Lake Superior. During this event most of the streams became raging rivers. Many of the trails in the local parks were destroyed by the raging waters. Several weeks after the storm we decided to drive over to Congdon Park and hike along Tischer Creek. There are three “trails” along the creek. One travels next to the creek. The main trail follows along the creek but not right next to it and the third is an old road that winds through the park. We quickly noticed that the trail directly along the creek was blocked by debris that had washed down the creek. The main trail had been severely damaged in places with a gullies that was several feet deep. The old road had been completely washed out in the upper section of the park. This is a photo of a bridge over the creek that was about 15 feet underwater during the flood. 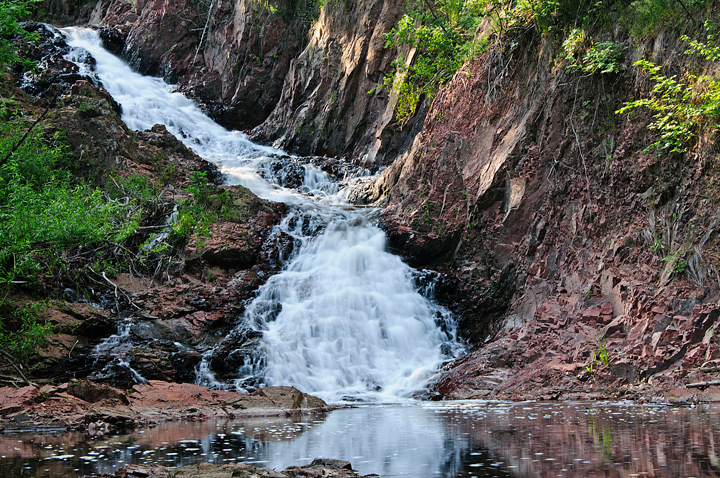 This fall we went back to Congdon Park to take some photos of Tischer Creek. The storm damage was still present although we were able to walk along the creek in most places and follow the main trail through the park. The city has assessed the damages and is currently either repairing or planning to repair the damage to the parks in the city. This is a photo showing the damage to the unused road through the park. Ironically the June storm was the last significant rainfall in Duluth during the summer and fall. 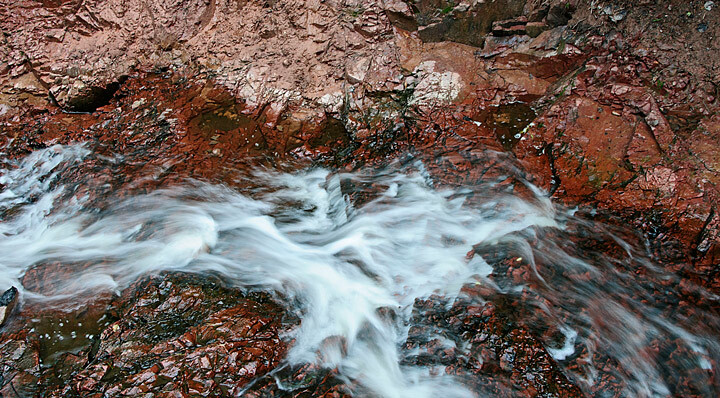 On this day the Tischer Creek was a serene setting with the Creek meandering through the canyon of volcanic rock. In the lower portions of the canyon the rock is a reddish color called rhyolite but it changes to a black as you move up the canyon. The water levels in Tischer Creek are low but there are still a variety of photos to be had of small waterfalls all along the Creek. More photos from our visit to Congdon Park can be found on my website.